many years ago a woman i only slightly knew emailed me. "you're really into japanese prints, aren't you? there's a used book up at pegasus you might like." i don't even know how she knew. i just know she was right. 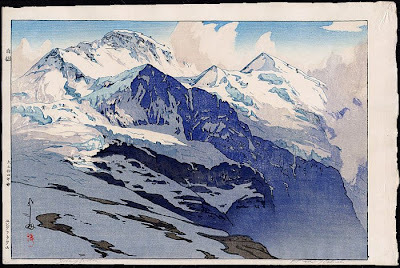 the collection of hiroshi yoshida's complete works has remained one of my treasures all these years since. now you can experience something like that as well. 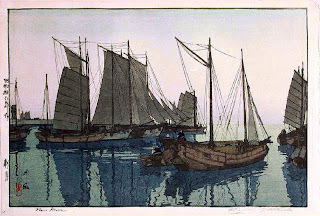 pomegranate has released a series of books absolutely essential to any student of this blog's subject, and the first, shin hanga, has some of the best and most stunningly reproduced selections of his works i've seen since. the shin hanga book is enhanced with beautifully reproduced works by toshi yoshida and ohara koson as well, and numerous other eastern and western printmakers we've covered here (and some we haven't!). the accompanying essay placing that moment into world and cultural history is written by barry till, curator of the asian prints department of the art gallery of greater victoria in british columbia. accompanying this are three additional books including one of gustave baumann's prints of the southwest which is, again, a treasure of images that are rarely bound and reprinted so beautifully into a book. 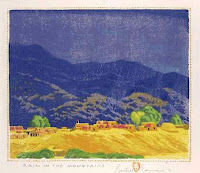 joseph traugott, curator at the new mexico museum of art, also includes related baumann's contemporaries with some rarely-viewed images, and baumann's own hard-to-find pre-print watercolors. find the other two books here and here. I love this stuff!!! I've never heard of him before so thank you so much for telling us about him! I love that style. I'll have to find that book! i'm so glad you like this stuff too! thanks for stopping by. just to say... there are four different artists featured in this post (you can see the artist's name by clicking on the image, and then reading the name at the top of the window). These are so beautiful they make my heart ache. thanks, nathan. neat how you were able to pair the same locations.